A South Korean flight attendant is suing Korean Air and a jailed former executive in the US over what became known as the "nut rage" incident. Lawyers for Kim Do-hee allege that Heather Cho verbally and physically attacked Kim Do-hee for the way she served nuts on a plane taking off from New York's JFK airport on 5 December. Cho later ordered the taxiing plane to offload another flight steward. Last month, Cho was jailed for one year for obstructing aviation safety. Cho - also known as Cho Hyun-ah - was a vice-president overseeing cabin service for Korean Air, and is also the daughter of the airline's chairman. She is appealing against her conviction. Ms Kim's civil lawsuit, filed in New York City, is seeking compensation for damage to her career, reputation and emotional wellbeing. It alleges that Cho screamed obscenities and hit Ms Kim after being served the nuts in their bag not a bowl. Ms Kim's lawyers said that "the evidence in this case will demonstrate that Cho's actions were not only humiliating, degrading, and damaging to Kim, but were also emblematic of Cho's unbridled arrogance and disturbing sense of entitlement". The summons also stated she was pressured to lie to government investigators to cover up the incident and to appear in public with Cho "as part of an orchestrated effort to try and rehabilitate Cho's public image", reported AP. They said the airline had not responded to Ms Kim's attempt to settle her claim privately. 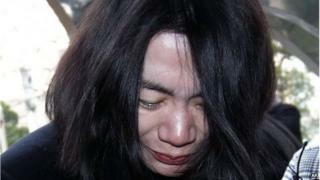 A Korean Air spokesman told the BBC that it had no comments on Ms Kim's lawsuit. Earlier reports said that after Cho was served the nuts by Ms Kim, she summoned head steward Park Chang-jin and confronted him about the presentation. Mr Park said in a television interview in December that he was forced to kneel in front of Cho, who then ordered him off the flight. The case opened a national debate about the Korean business system, which is dominated by family firms known as chaebols.